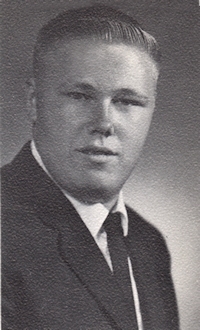 Obituary – Pricer, Eli Harold « Perry High School Alumni Association, Inc.
﻿Wrestling ’61-’62; Football ’61-’64; Baseball ’61-’62; F. T.A. ’63-’64; Christmas Vespers ’61-’62; Speech Assembly ’62-’63. ﻿Eli H. Pricer, Jr. 43, died at 6:30 p.m. Saturday at Green Valley Nursing center. Graveside rites will be at 10 a.m. Tuesday at Grace Hill cemetery. Rev. Lynn Scott, pastor of the First Christian church, will officiate. Arrangements will be under direction of Brown Funeral home. Pricer was born at Perry, Aug. 21, 1946, the son of Eli and Maxine (Passow) Pricer. He attended Perry schools. He was a 13-year employee of the state department of transportation before his retirement in 1983 due to ill health. He was a member of the First Christian church. Survivors include his father, Eli Pricer Sr., Perry; a brother, David Pricer, Lewisville, Texas; and a nephew, Mike Pricer, also of Lewisville.